I met up with David & Lynsey to discuss their wedding at the Two Brewers Pub in Windsor. They were extremely sweet and we talked through their whole day which sounded amazing so I couldnt wait for their big day to come around. 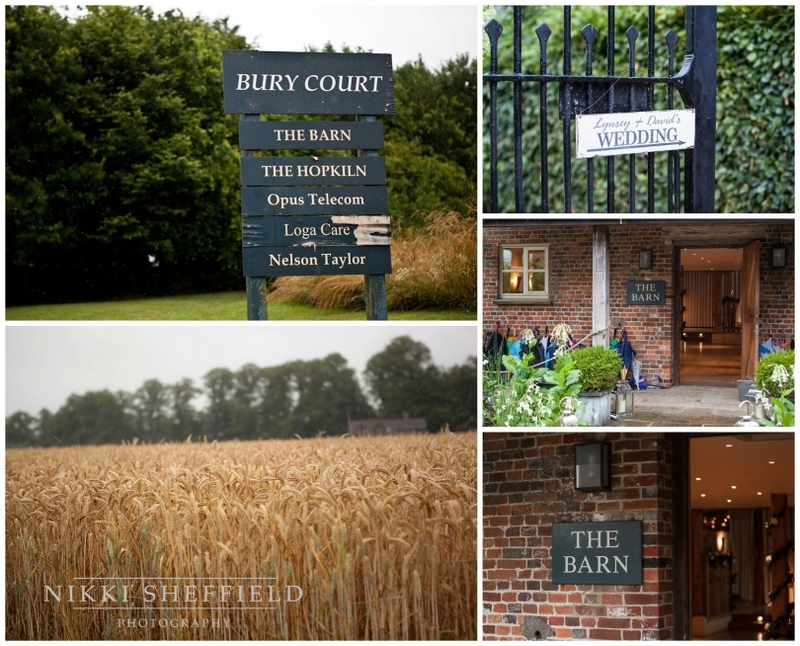 It was to be held a the The Barn Bury Court in Bentley Farnham, Surrey – a stunning Barn venue set in gorgeous gardens surrounded by beautiful fields. The bridal party were getting ready in the cottage when I arrived. It was raining hard but everyone’s spirits were up and there was an excited buzz in the room. Lynsey already look beautiful and she hadnt even finished getting ready. Her dress by Caroline Castigliano was hanging in the bedroom and I went about photographing the details including an exquisite vintage heart jewellery set leant to her by one of her bridesmaids. Everything was just perfect from the the flowers to the shoes. The rain continued as the Groom, Best Men and the guest started to arrive – everyone was getting in place and anticipating the Bride to arrive. The civil service was absolutely lovely and David & Lynsey looked so in love as they exchanged vows – its such an honour to witness these incredibility special moments from a single look to the the first kiss. After the service drinks were served in the Barn while we took the group shots and with no let up in the heavy rain everyone kept their sense of humour as we stayed outside the Barn with umbrellas at the ready. The Barn was decorated with stunning flowers, a beautiful framed table plan and a sweetie table for the children. The Bride and Groom started off the speeches before the wedding breakfast and the Best Man delivered a very funny speech before the guest enjoyed the wonderful food by Jacaranda Catering. After the meal the Bride & Groom cut the cake and then took to the dance floor for their first dance as Husband & Wife. They were both such a lovely, relaxed and beautiful couple which made for a fantastic and memorable day…. Special thank you to Paul McGee for all your hard work and your assistance on the day – it was lovely to work with you.